Over the past four years, there hasn’t been a more dominant franchise in sports than the Golden State Warriors. 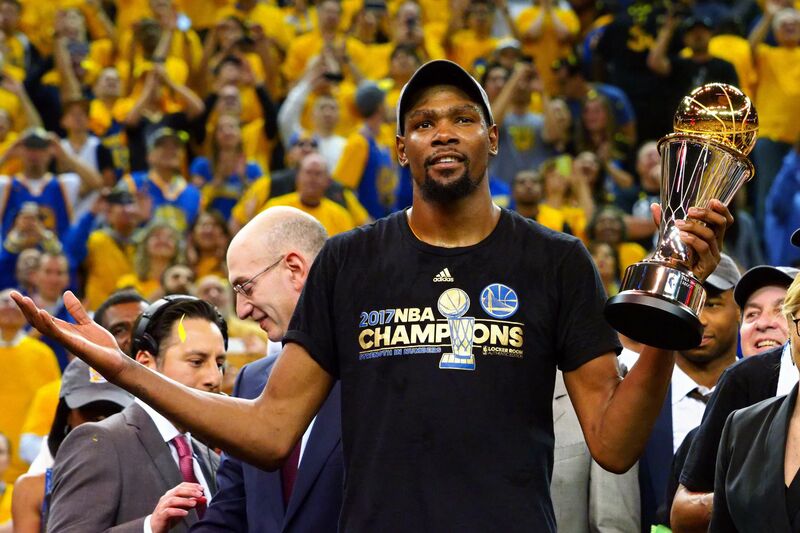 From 2015-2018, the Bay area has witnessed three NBA titles, four conference championships, a record-breaking 73-9 record, and a ludicrous 265-63 record over four seasons (81% win percentage). This success resulted in many labeling Golden State as unfair, as hordes of casual NBA fans have begun to hate the Warriors. Furthermore, in a state-to-state survey conducted by sports analytic site, Zcodesystem.com, the Warriors were by-far voted as the NBA’s most hated team as 26 states revealed their disgust for the Bay Area Bombers. While many fans despise Golden State, I actually adore them. NBA fans need to set aside their jealousy and appreciate the reasons why this team is so loveable. Stephen Curry is the main reason behind the Warriors unselfishness. Curry’s self-sacrificing personality makes it easier for Warriors players to gel into Steve Kerr’s system. Photo By: Kyle Terada, USA Today Sports. Don’t get me wrong, the Warriors are filled with talent. All five of the Warriors starters have combined for 26 All-Star appearances, winning 4 MVPs and a Defensive Player of the Year award. Although the Warriors have a juggernaut of skilled individuals, it is the way they play that makes their dominance a beautiful spectacle to watch. Unlike other star-filled teams, the Warriors implement their talent correctly and through their unselfishness, mesh five all-stars in Steve Kerr’s selfless basketball system. For the 5th straight year, the Warriors are leading the NBA in assists per game. Golden State’s passing, cutting and screening away from the ball gives NBA viewers a nice mix-up from the isolation, ball-dominant NBA world we live in. Many dislike Golden State due to the team’s tendency to showboat following a big shot or dunk. But with that being said, are the Warriors antics showboating or just players having fun and rooting on their teammates? This sport is meant to be fun, and I don’t believe NBA fans should bash Golden State for relishing playing a game they’ve loved their whole lives. Ultimately, basketball has never been played at a higher level, and NBA fans need to appreciate the Warriors brand of basketball since it is something that we have never seen before…EVER. If you look at many of the NBA’s super-teams over the past eight years, many were built through players teaming up in free agency. Notoriously, the 2010-11 Heat and 2012-13 Lakers were teams where all-stars signed together in the summer. Most fans don’t realize Golden State built their team through the draft. In 2009, Stephen Curry was selected with the 7th pick, a pick that still leaves Timberwolves fans scratching their heads (Johnny Flynn, Ricky Rubio). In 2011, Curry began his work alongside eventual “splash brother,” Klay Thompson, as the sharpshooter hailing from Washington State was selected with the 11th pick. A year later, General Manager, Bob Myers, found a diamond in the rough by selecting future All-Star and Defensive Player of the Year, Draymond Green, with the 35th pick. Myers also hired head coach Steve Kerr, who introduced a newfound philosophy centering around ball movement in the 2014 season. These four pieces, along with the acquisition of Olympian, Andre Iguodala, turned the Warriors into a dynasty. The Warriors won the NBA title in 2015 and set the single-season wins record (73) the following year. Many people argue that Kevin Durant and Demarcus Cousins boosted Golden State to super-team status, but those critics must understand the Warriors were well on their way with or without, signing marquee free agents. Unlike the 2011 Heat, this dynasty was not founded through a bidding war over superstars, but ingenious front-office decisions and groundbreaking coaching philosophy. NBA fans need to appreciate the franchise’s stellar work from top to bottom by the players and the executives. Many argue that dynasties and Golden State’s dominance is terrible for the NBA, but there are statistics that show otherwise. Statista reports that NBA Finals ratings from 2015-2018 (All of which featured Golden State), are the highest for a four-year period since 2000. Moreover, the NBA understands Golden State’s popularity, slotting them in 40 nationally televised games throughout the 2019 season. Even though fans may root against Golden State, they all seem to tune in. Furthermore, the dynamic duo of Stephen Curry and Kevin Durant rank second and fourth in league jersey sales respectively (NBA.Com, 2019). Although fairweather fans may consider the Warriors success as boring, this ongoing dynasty continues to produce the NBA hundreds of millions of dollars. What the Golden State Warriors have done is something that the NBA has never seen before. This team is playing at the highest level in the world yet, fans continue to root against them. I call for NBA fans to wave the white flag with the Warriors hatrid because it will be decades until we see something like this team ever again.